The air purifier market is overbuilt, there really isn't an unfilled niche anywhere. But Alen Corporation is trying to create one, with a "green" marketing angle on a new product called Paralda. Paraldas may turn out to be the Toyota Priuses of air cleaners. 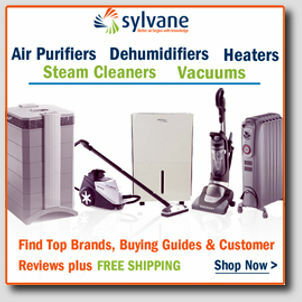 The vast majority of air cleaners sold in the US are low cost imports - "department store air purifiers." These mass market products typically have low profit margins. The Alen brand, seeking the higher margins in the lower volume, Eco-sensitive, upscale segment, has produced a "halo" model. The greening of the entire brand image could possibly justify price premiums. David Oreck was the first to employ the brand-image-price-premium strategy in air cleaners, he made millions. Initially introduced as the Alen "AirMD," the name was subsequently changed to the more mystical and elegant "Paralda." The majority of air purifier purchases are made by women, based on internet imagery - both visual and text based. So the new design needed distinctive elements - again both visual and in text copy - to stand out from the herd of boxy, sometimes indistinguishable, on-line competitors. The result is a slick tower air purifier, sharply styled with a frosted-translucent outer skin over white or bamboo green internals. Without a doubt Alen's halo model is attractive looking. In the text which supports the photos, green imagery must abound. The new purifier is "lead-free," Energy Star qualified, and "ozone safe." Let's take a closer look this Chinese-built air cleaner. Beyond first impressions, Paralda is a bit less impressive. Actual technical details are obscure or absent from marketing literature. Marketing materials assert that Paralda is "high performance" and the "most powerful" air purifier available. Light touch activation controls on a very appealing electronic display activate the Paraldas four-speed fan. But the electronics are limited: there is a 24-hour programmable timer; but no automation; no pollutant sensors; no remote. Paraldas are quoted as having a CADR (AHAM certified clean air delivery rate) around "140 to 150." No Alens are currently AHAM certified. Regardless of certification, 150 CADR is a weak air purifier, "most powerful" is three times that much. The recommended room size "up to 400 square feet," is far too large for a 150 CADR machine. Try 150 square feet for better results. To complement the stylish exterior, air vents are concealed on Paralda's sides and back. This is a technical no-no. Prefilters catch the big particles which shorten main filter life. Predicted HEPA filter life is a short 6-9 months under continuous daily use. Paralda's HEPA is advertised as "99.97% effective," but little other information is available. Smart consumers will be asking "99 percent of what?" HEPA filters must capture 99.97% of .3 micron particles, is this a true-HEPA filter? The convenient slide-in filter tray, and easy access door on the Paralda's top, suggest air leakage (bypassing) may be a possibility. Paralda filters, TF50 or TF50-MP odor, are not treated with anti-microbials. Replacement filter prices are around $50. A filter replacement indicator appears to be the less expensive timer variety. The standard Paralda has no carbon filter. Carbon filters restrict airflow and add costs. They also collect many odors and chemicals, principal household air pollutants. So Paralda started as a particle catcher only. Alen Corporation eventually corrected this omission with a combined HEPA/odor filter said to employ a proprietary technology named "molecular conversion process" (MCP). Alen claims this as a breakthrough, but in reality it is a thin layer of finely granulated carbon. Even with the optional TF50-MP odor filter, Paralda is less than ideal for smoke or odor removal. Well, how about the ultraviolet lamp? Reviewers at www.1greenproduct.com, using a watt meter, estimated the lamp's current draw at just 5 watts. The bulb displayed on the Alencorp site looks to me like an F8T5BL 8 watt T-5 type UV-A Longwave (365 nm) blacklight. That's a very modestly powered ultraviolet lamp, providing a clue to the predicted 3 to 5 year extended lamp life. Typical UV lamps in other air purifiers last only one year, with progressive power loss after 6 months. Paralda Replacement UV Lamps (PAR-UV) run about $59.00. A UV bulb replacement indicator informs users when the lamp is dimming. F8T5BL, with emissions peak at the 365 nanometer wavelength, is not really a germicidal lamp for air cleaning, its main purpose is keeping the filter free of microbial growth. Alen says Paralda's independently controlled ionizer is "ozone safe." Is this the same as zero ozone? No figures or tests are offered to substantiate this generality. Paralda marketing states the machine "does not produce elevated noise levels." But making 39 dB(A) on low, and a serious 60 dB(A) on high, Paralda is not quiet relative to other modern purifiers in it's power class. Paraldas weigh 17 lbs., and measure 8" wide by 11"deep and 28" tall. The "lightweight and portable air purifier" tag is true. Energy used is 19 Watts on low, 29 Watts in second, 41 Watts in third, and 55 Watts in high. The "Energy Star qualified" claim seems to be based on calculations, since only the Alen 350 appeared on the EPA listing when this article was written. Paralda's ratio of CADR to wattage use is 2.4, which would qualify it for the EPA list, but is not a stellar achievement. In Program Mode, the 24 hour clock is illuminated. Manual Mode is signified by a dark clock face. Marketing research has shown that many consumers cannot distinguish between broad environmental issues and personal lifestyle choices. Paralda is European Union Reduction of Hazardous Substances (RoHS) regulation compliant. The 2006 EU law restricts hazardous chemicals in electronics, including lead, mercury, cadmium, PBB’s and PBDE’s (flame retardants). While this is laudable, marketing appeals to the uninformed by implying that competitor's products have lead emissions during household use. These regulations are targeted at environmental waste, not indoor air quality. While green is good, it doesn't necessarily mean cleaner indoor air. Alen's strongest selling point is the company's unparalleled lifetime warranty. The manufacturing quality of the Alen product is probably the best of any Chinese export. Alen will accept and refit any Paraldas that have defects, their aim is to establish a reputation for durability, eco-friendly products, and quality customer service. The fine print confines the warranty to first owners who buy filters from the company every six months. Alen Corp deserves credit for upping the ante for other air cleaner builders with their green initiative. But the halo effect may be shadowed by the product's technical shortcomings. Paraldas retail in the entry-level premium class - four hundred bucks. Frequent filter changes, at $54.95 at least twice annually, boost the attractive air cleaner into the most expensive "luxury" category. The machine's actual air cleaning performance does not justify that price. Buyers are paying for the aesthetically elegant design and environment-friendly image. This machine is perfect for making a first impression. Professional offices, upscale entertaining, and other decor conscious applications are fitting. Where health is the driving force, consumers should keep looking. But the Alen Paralda is an acceptable air cleaner for style conscious niche applications. Alen Paralda Air Purifier at Amazon.com.